Except where prohibited by law, Seal Now products. Hereby warrants as follows: If this product fails to perform as specified, when applied according to label instructions (available upon request). Sufficient additional product will be supplied up to the volume to correct the condition. 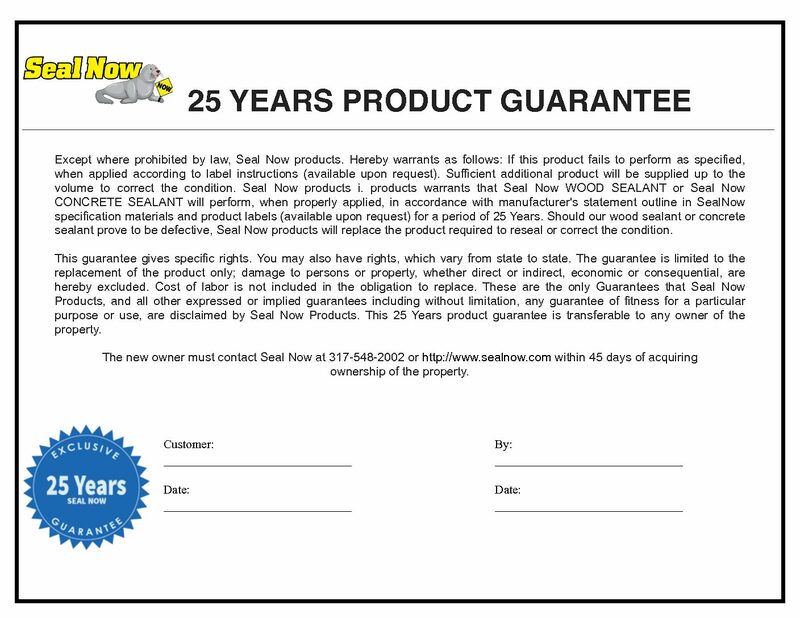 Seal Now products i. products warrants that Seal Now WOOD SEALANT or Seal Now CONCRETE SEALANT will perform, when properly applied, in accordance with manufacturer's statement outline in SealNow specification materials and product labels (available upon request) for a period of 25 Years. Should our wood sealant or concrete sealant prove to be defective, Seal Now products will replace the product required to reseal or correct the condition. This guarantee gives specific rights. You may also have rights, which vary from state to state. The guarantee is limited to the replacement of the product only; damage to persons or property, whether direct or indirect, economic or consequential, are hereby excluded. Cost of labor is not included in the obligation to replace. These are the only Guarantees that Seal Now Products, and all other expressed or implied guarantees including without limitation, any guarantee of fitness for a particular purpose or use, are disclaimed by Seal Now Products. 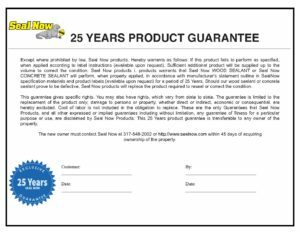 This 25 Years product guarantee is transferable to any owner of the property. The new owner must contact Seal Now at 317-548-2002 or https://www.sealnow.com within 45 days of acquiring ownership of the property.